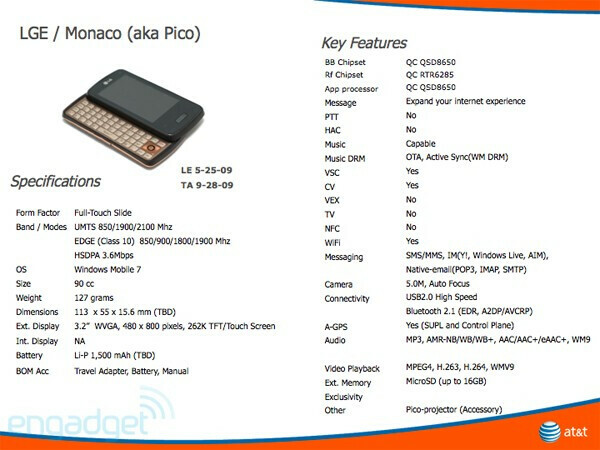 Here is yet another WM phone rumored to come out soon on AT&T, the LG Monaco, also known as the Pico. Now, you would probably want to know where that Pico thing came from. Wonder no more, as a leaked slide speaks of a Pico-projector accessory. We do not know whether it is coming in the box or you’ll have to shell out some extra cash. On second thought, the latter seems more plausible. However, the LG Monaco is listed as a WM7 phone with a September 28 launch date, which is, of course, so not going to happen. If the schedule remains the same, we would rather count on LG rolling it out with WM6.5. Other cool features are the 3.2-inch touchscreen with 480x800 pixel resolution, sliding QWERTY keyboard, 5MP autofocus camera, Wi-Fi and global 3G. Sounds promising indeed. *Update*: It is also worth mentioning that the LG Monaco will actually utilize the Qualcomm Snapdragon 8650 processor! Sweet looking phone! LTE FTW! Oh snap, it has a snapdragon in it!!! !